We hope that 2013 holds many more blessings and beautiful memories for everyone! 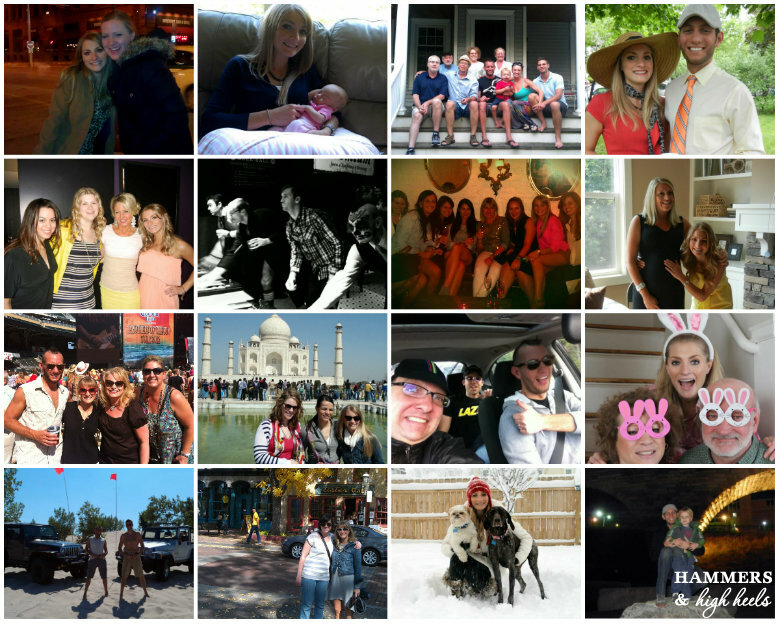 Thank you for sharing 2012 with us, have a safe and happy New Year's Eve! Cheers! 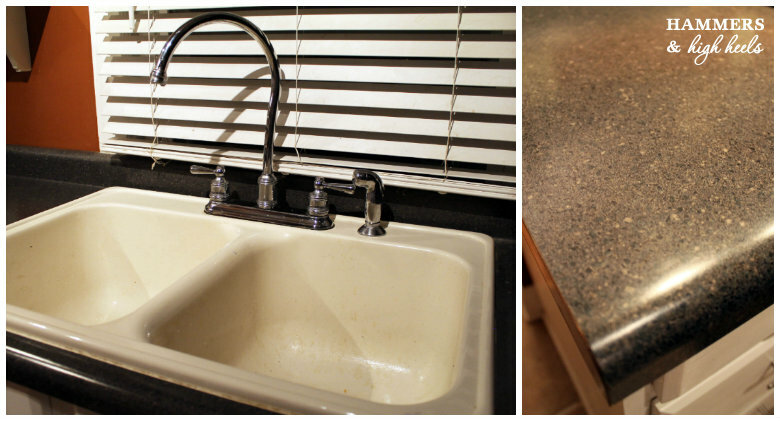 Out With the Old, in With the New... Countertops, Sink, & Faucet! We are getting ready to kick off the new year with a BIG new project. BOY, we are pumped, amped, geeked, gee... I am practically peeing my pants (not really though, ick!). Why? Because we are going to be changing the look of our kitchen with new countertops, sink and faucet!!! And HELLO! To these new friends! A single handle pull-down sprayer faucet, oak wood countertops,and a gorgeous oh-so-dreamy ceramic double bowl apron sink! Ugh, wood countertops, apron sink, ahhh it's so exciting! I might pee my pants now, ha! Yep, we decided it was time to finally make this change since we've been talking about it since we first bought our house. 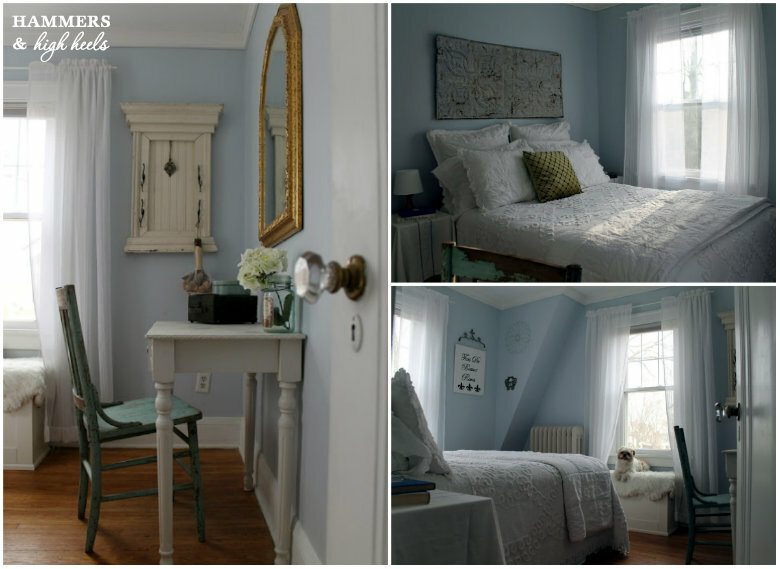 Aren't these inspiration photos just gorgeous?!? 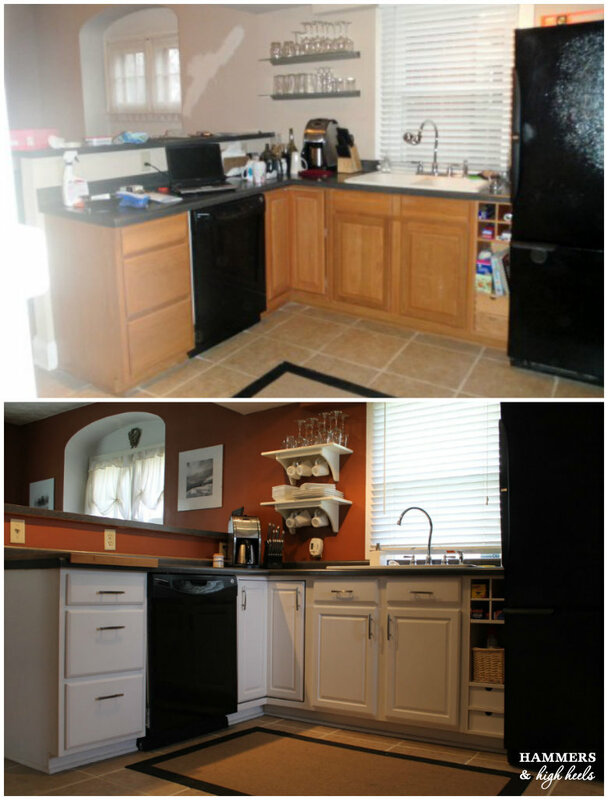 ﻿The story behind all this begins with the nice but minimal update to the kitchen just before Thanksgiving in 2009 (which was before our blog even existed). 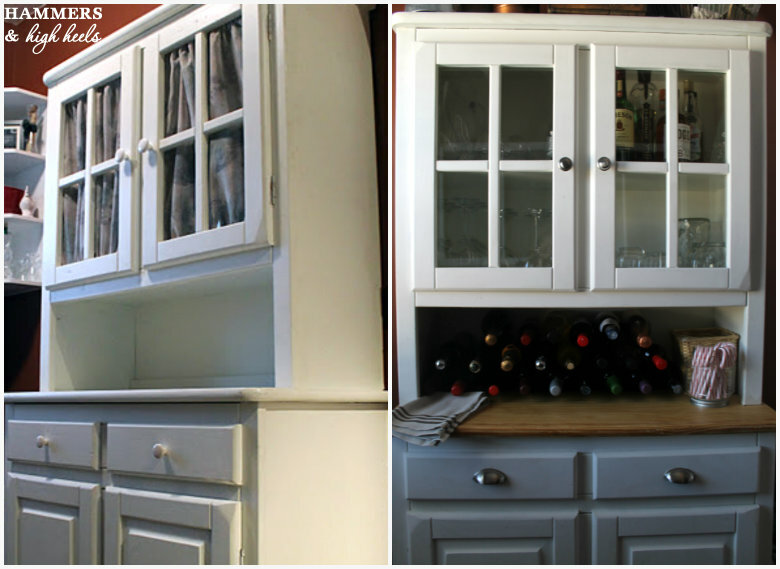 Once I started the blog in May of 2010, "Our Kitchen Cabinet Redo" was the 7th blog post we wrote (crazy and fun to look a fact up, and sorry our older posts are so wordy/junky, ha!). 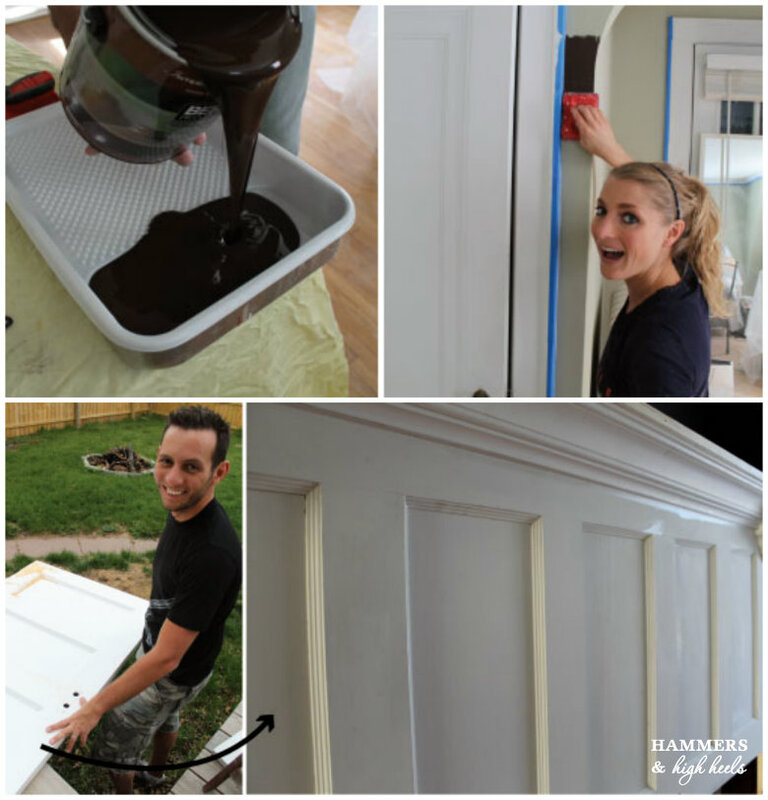 I included details about painting the walls, cabinets, replacing the hardware and light fixtures in the post, but we also mentioned what else we would like to do in the future. So, to quote myself- which is kind of funny- I said... "Next on our wish list for when we really redo the kitchen is a new sink, new countertops, wood floors and of course getting the matching stainless steel dishwasher and fridge... but all in time! Patience and saving some moolah is key!" Well, after looking at that list we realized it's been almost 3 years time, we've saved moolah for the project, and did additional product and budget research. Patience? Check. Moolah? Check. Research? Bonus gold stars :) just because I like extra gold stars. Anyway, back in 2009/2010 when we started blogging and did our 1st redo on the kitchen, I read This & That's post about their newly finished butcher block countertops and haven't forgot about it since. 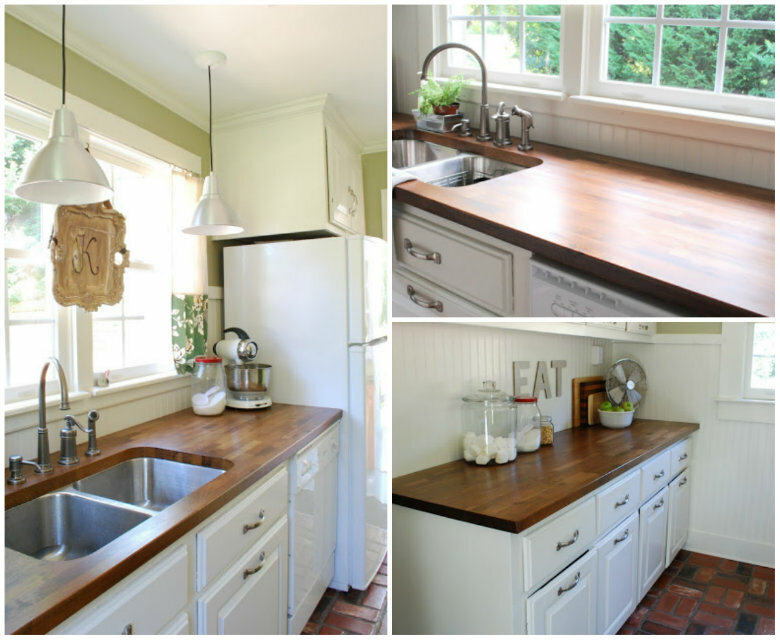 I loved the way their new wood countertops looked in the house! 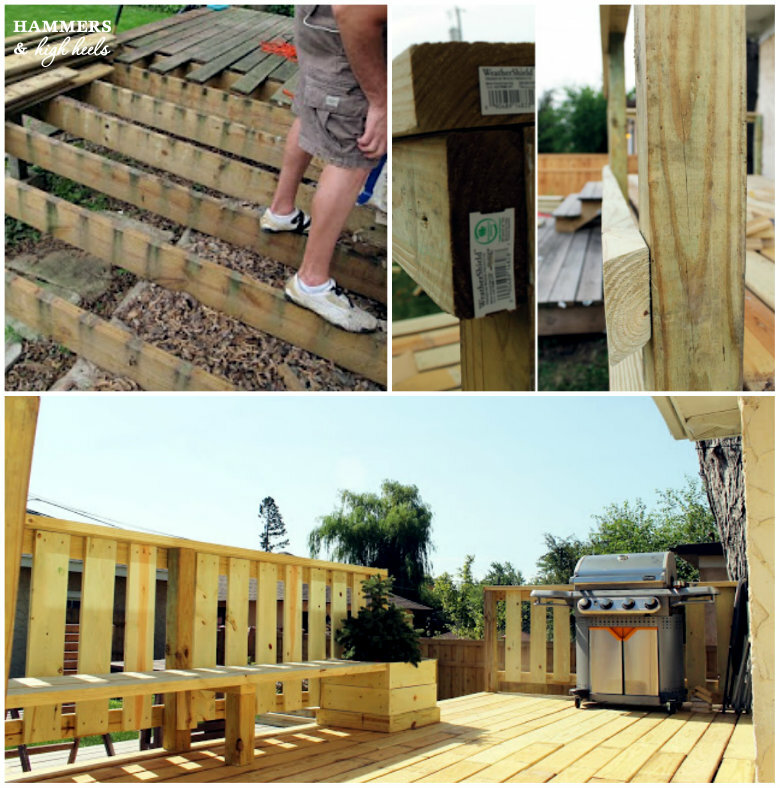 I also loved that they detailed all the DIY steps to complete the project, so I knew when it came time it would be something Alex and I could tackle. 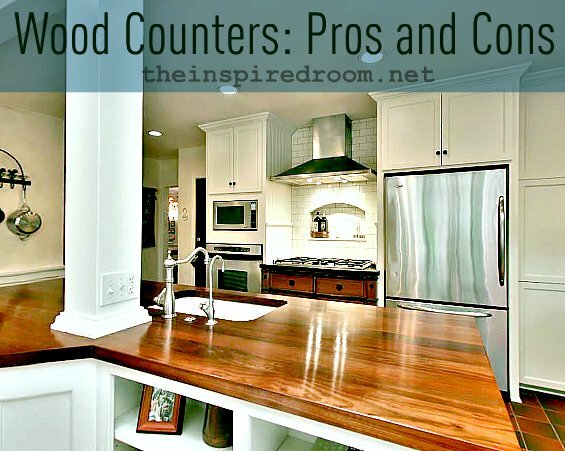 We also read a few articles like this one from other bloggers talking about pros & cons of wood countertops. Both helped us to understand challenges, maintenance, installation, and wear over time when it comes to wood countertops. We will cover some of those topics in the future posts about the project as well (so stay tuned). Adding these wood countertops just furthers my quest in making our little Dutch Colonial look a wee bit more George & Nina Banks fictitious home:) at least on the inside- the outside is still a ways off, that George Banks had some mad skills when it came to landscaping right?!? Whoops, okay a bit off subject but you get the idea right? We area really excited to make this change in our house! I know we aren't going anywhere anytime soon, but if we ever did want to sell our house any buyer (or guests/friends) would think the same thing we thought if we left the laminate as is, "hmmm, those countertops need to be replaced." Although practical, nobody ever 'oohs' and 'awws' over laminate right? I know I haven't! I feel it's time for me to finally 'ooh' and 'aww' in our kitchen! I can't wait to kick 2013 off with this update! Hope you will join us too! 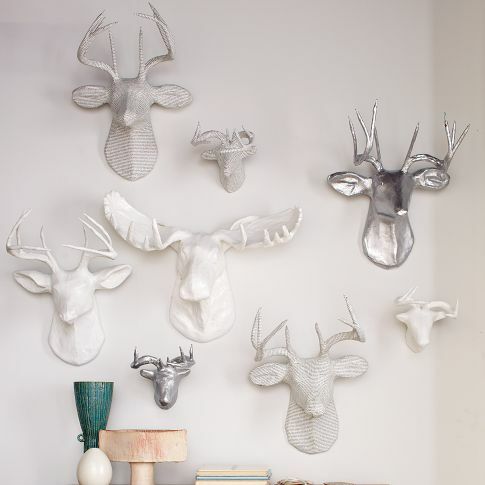 Time for a manly (yet still very nice decor oriented) DIY Friday post, from Mr. H&HH. 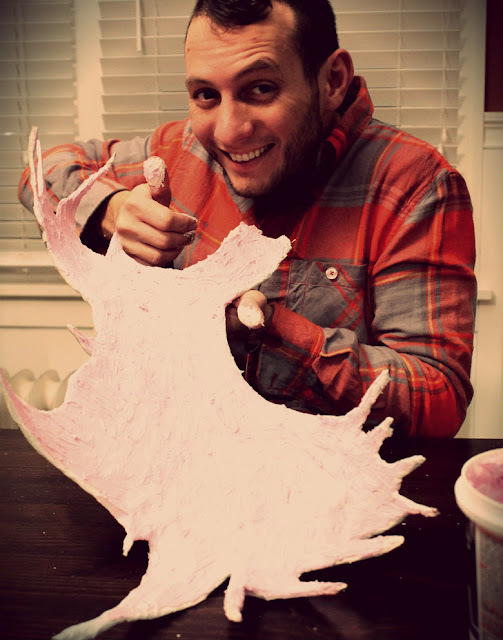 I'm happy to be updating you all with my homemade paper mache moose antlers. As with most of my projects, these took a tad longer than I had originally estimated but I am really pleased with the end product. Best part of all - this cost me about $6...not $900! Quite some time ago, in a dining room not too far away, a wild idea spawned from Carla's lodge/north woods cabin themed holiday decor. 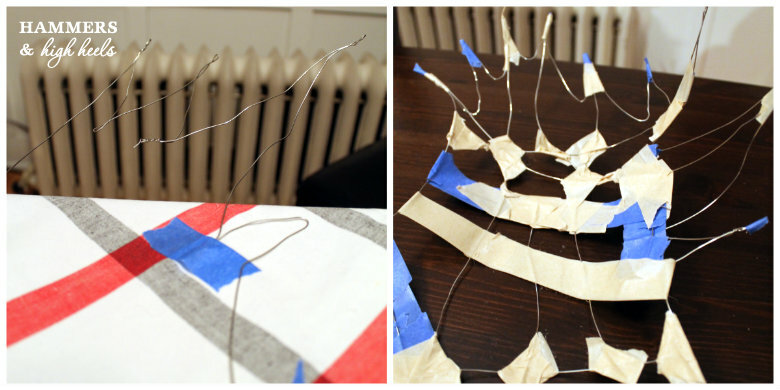 The idea grew slowly and started with with nothing more than simple 20gauge hobby wire and masking tape (in hindsight, a slightly larger gauge would have made this project slightly easier). I knew that I would need a sturdy skeleton to attach the paper mache to, and the hobby wire served as the perfect platform. I spent my first night twisting, taping, and bracing the shape of the antlers (seen below), while Carla laughed at me and made sexist cat calls and whistles (just kidding). The main shape construction was then followed with further support from "cross section" hobby wire pieces and masking tape. Next came the fun part - a quick trip back to 2nd grade art hour...flour, water, and paper come together to create a beautifully artistic platform...Paper Mache! This stage took two nights as there was a lot of drying time required. 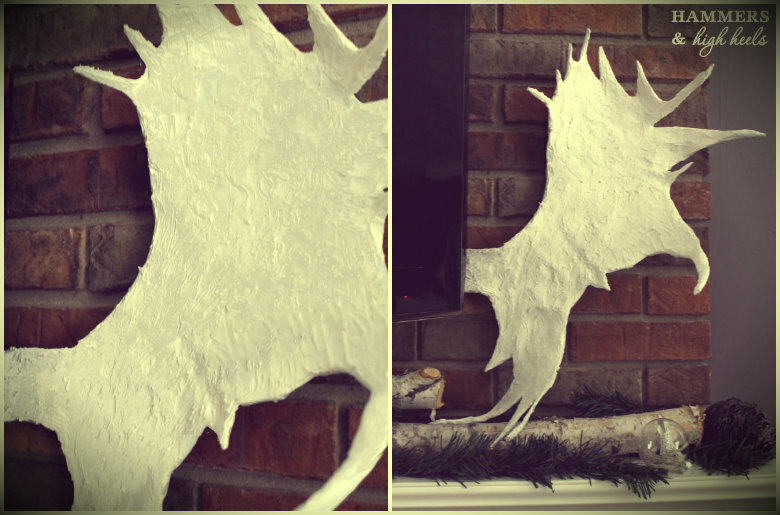 I focused on the top (forward facing) part of the antlers on the first night and then the back on the following night. The result was a hard/sturdy cast of my DIY moose antlers. I wasn't certain which option would be best for painting the end product so, I grabbed a couple from Home Depot and a leftover from the basement and got to work! Sadly, after a coat of nearly EVERY spray paint that we own....I still didn't have quite the look that I had imagined. Alas, I was not defeated! I realized that all of the paint left an end product that was far too glossy and left much to be desired with newspaper seams and a serious lack of depth. 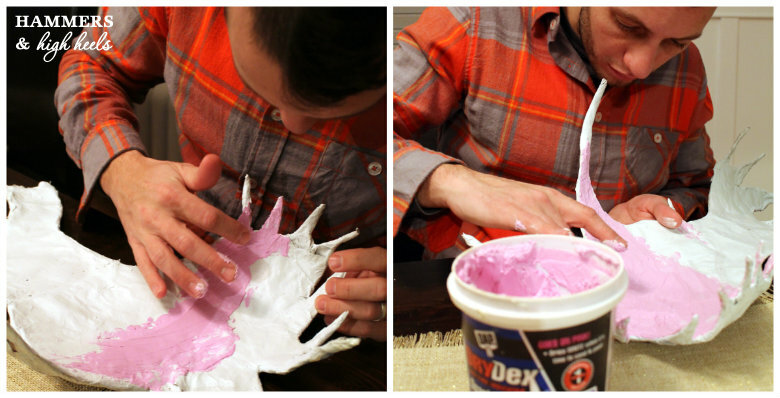 The solution: drywall repair spackling. 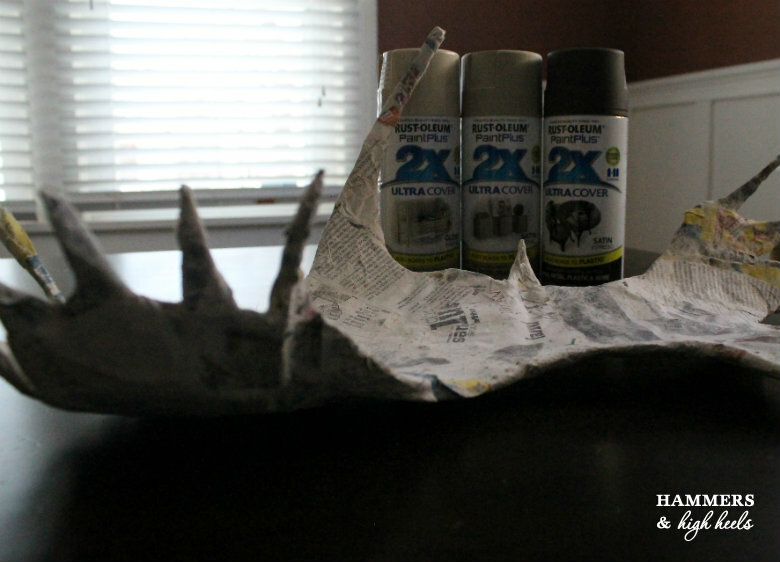 With the addition of this simple "repair" I was able to achieve a more natural look for the antlers while also adding some much needed depth. The best part - the spackling dries white and looks like perfectly sundried antler bone!! So, what do you think? Did my antlers turn out nicely? There a bit smaller than the fancy ones that served as my original inspiration from Etsy....and again, they cost about $890 less!!! 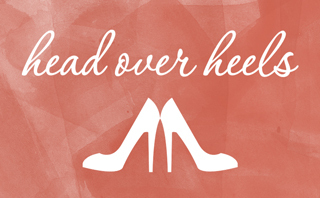 Are You Head Over Heels? I know I am! Thumbs up for DIY Moose Antlers!!! 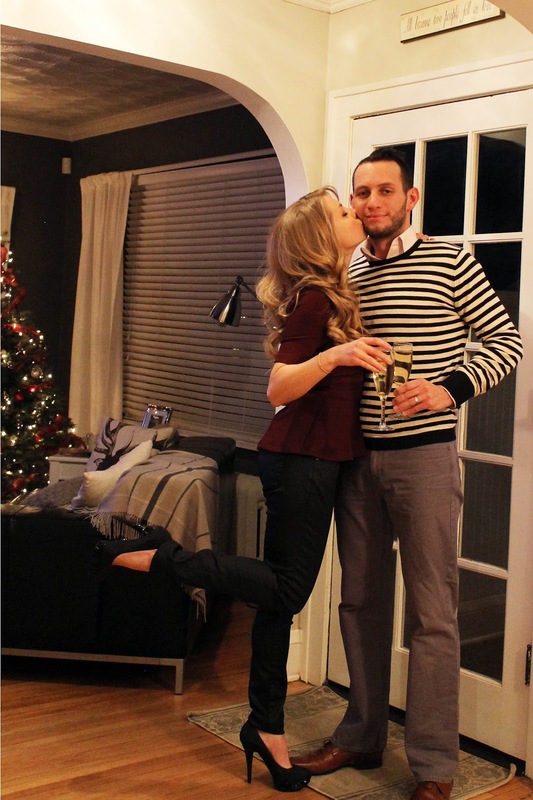 Carla and I hope you have a great New Year's weekend! We are thinking of diving into a new home project instead of spending on going out, what are your plans? 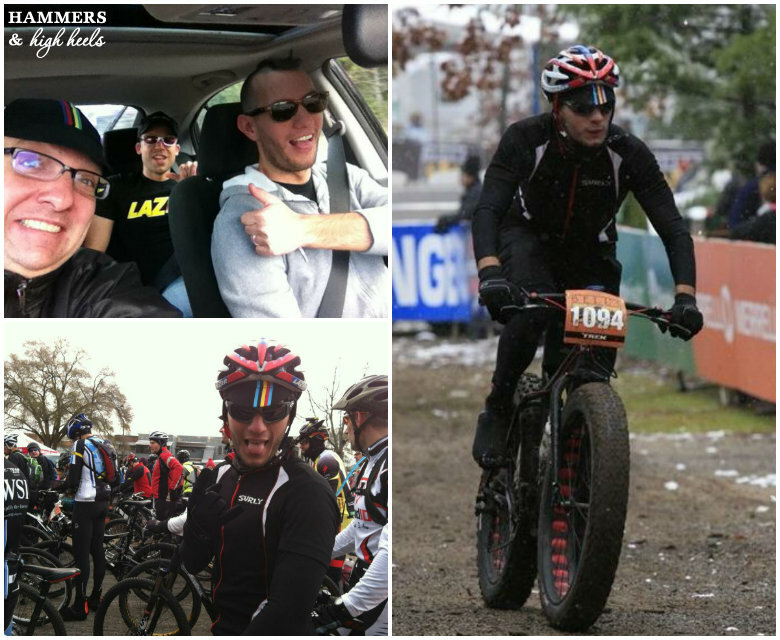 Hammers & High Heels Year in Review- 2012 Projects in a Flash! 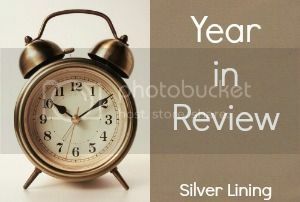 I can't believe 2012 is almost over but as each year comes to a close, I've always loved looking back at the the year through our blog. One of the blessings about blogging, is that it becomes a place where we've captured a glimpse of our lives along with the things we have accomplished in our home. 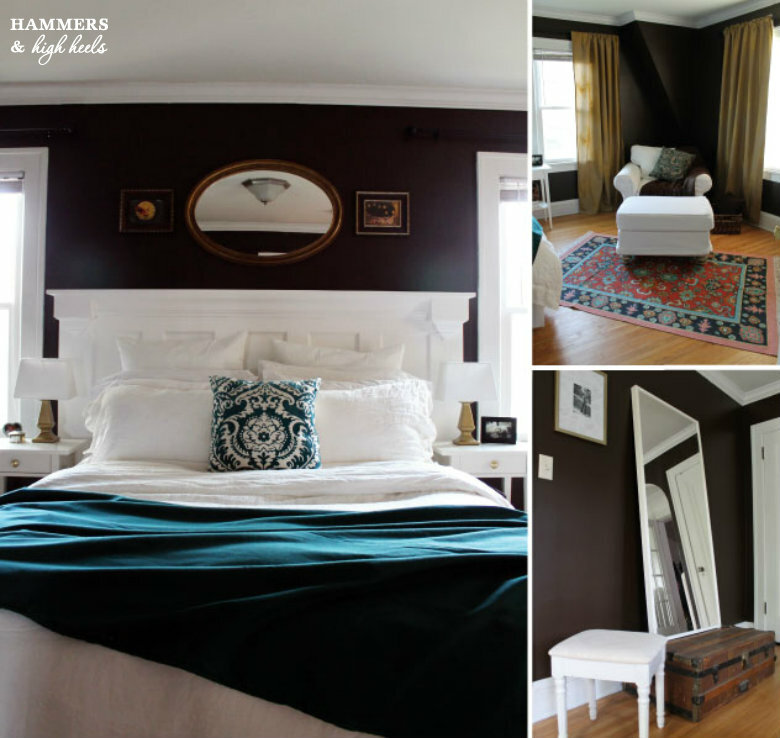 It's funny because if somebody asked me what I did this year I would say, "Hmmm not a whole lot, travelled, we redesigned our bedroom & deck, I think that's it?" But once I gathered up all of our photos through the months and got to reflect on things, it helped me appreciate all that happened in 2012- even if they were small, heck it even seems like we did a lot? ! So, cue the paint, hammers, nails, saws, band-aids, sandpaper, screwdrivers, and trips to Home Depot.... oh and of course Alex's curse words (no project is complete without them), here's our Hammers and High Heels 2012 Project Review! 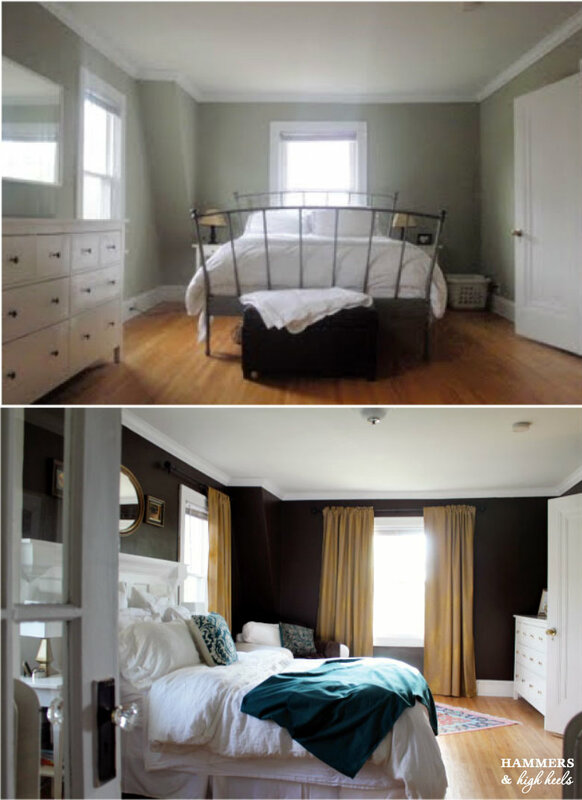 We kicked off 2012 with a BIG project to tackle, our Master Bedroom redo. This ended up being a lengthy project stretching all the way into April but the before and afters totally speak for themselves! 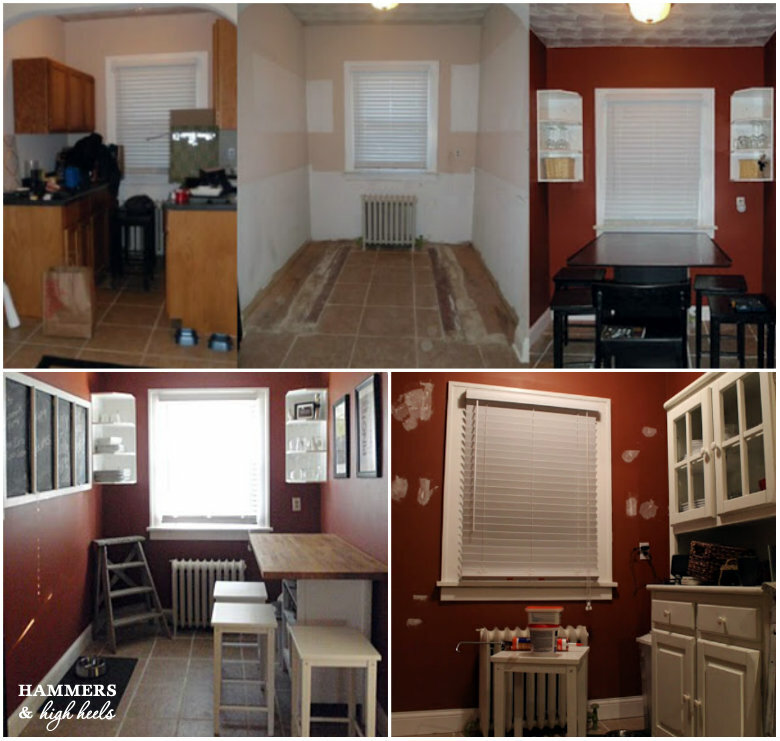 Earlier in the year, we also started working on our kitchen nook. The space has been hard to figure out but once I added my $40 thrifty hutch and transformed it into a Barmoire the space started looking up! 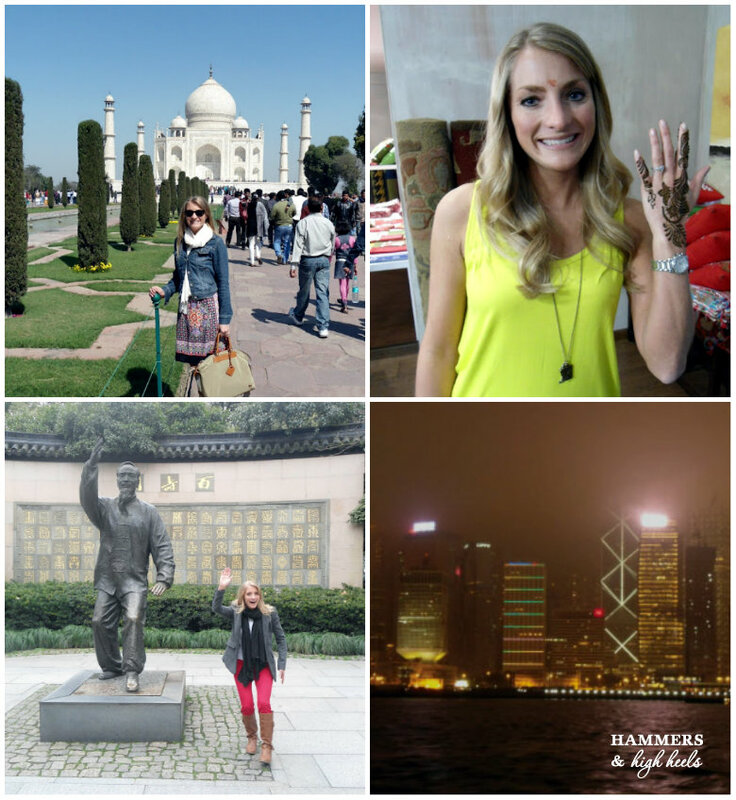 As we rolled into March, I had to take a business trip to New Delhi India, Hong Kong, and Shenzhen & Shanghai China which included a visit to the Taj Mahal. 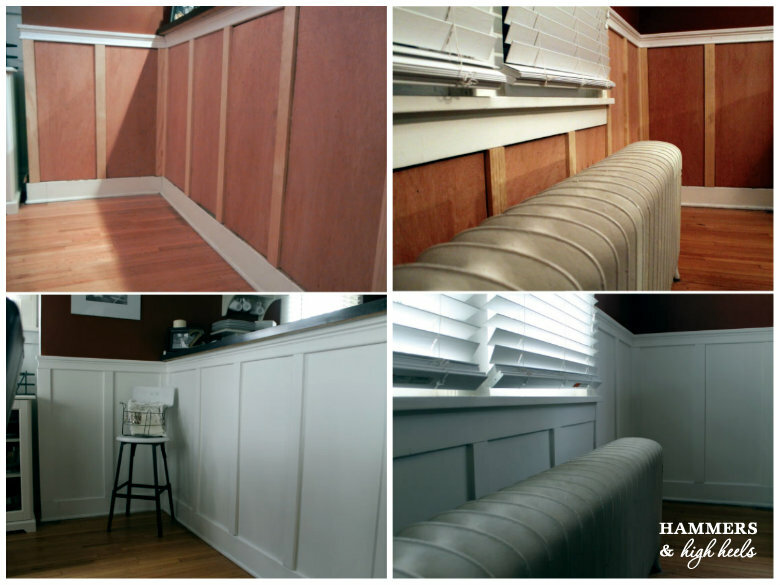 While I was away for 17 days, Alex kept himself busy adding wainscoting to our dining room. Talk about an awesome surprise to come home to! I LOVE the updated formal look! Also while I was gone (and just because I can't let Alex forget this one) he did this to our Jeep. Alex is ready for the Zombie Apocalypse if it ever happens y'all. 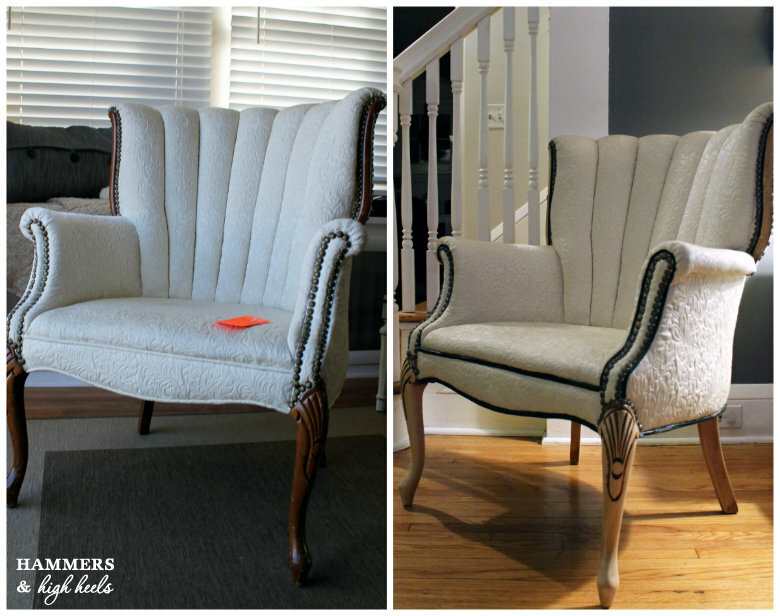 Rolling into summer, I freshened up the look of our Living Room and did it for just $50! I still can't believe what the room looked like when we moved in, it's come so far! 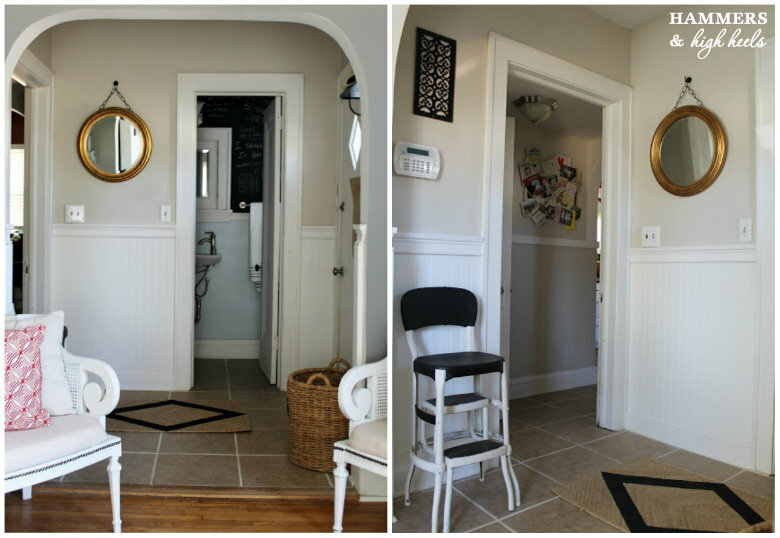 ... AND adding beadboard to the back entryway. Gotta love a man that likes to stay busy right!?! 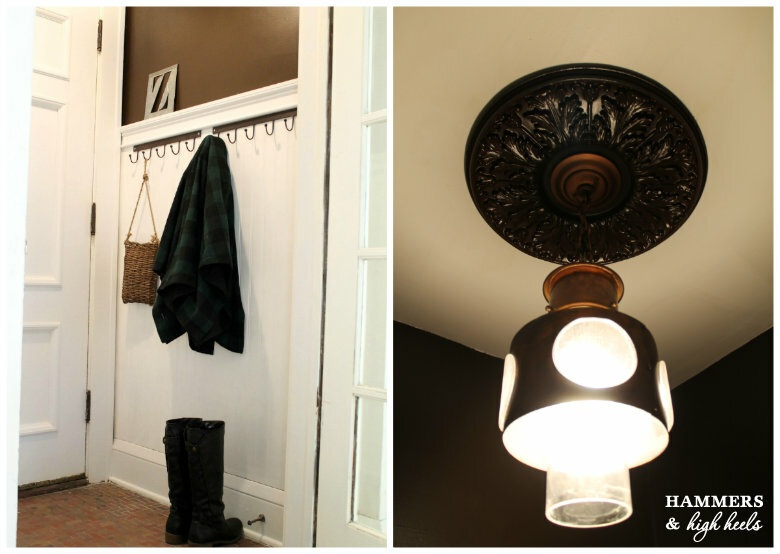 ... and updating the decor at our back entryway. 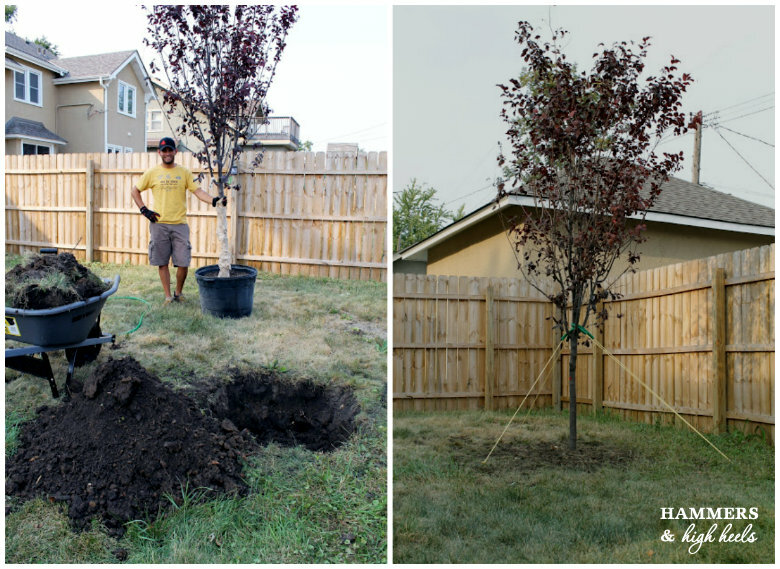 Around the time fall began, Alex and I finally planted a tree to replace the one we lost from the May 2011 Tornado. 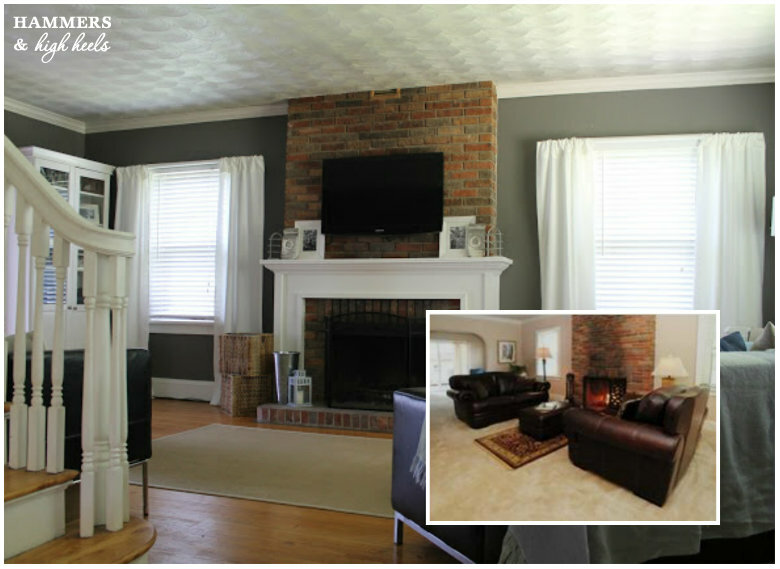 We also enjoyed the excitement of Stylist Home featuring our house "Before" & "Afters" and writing an article along with! 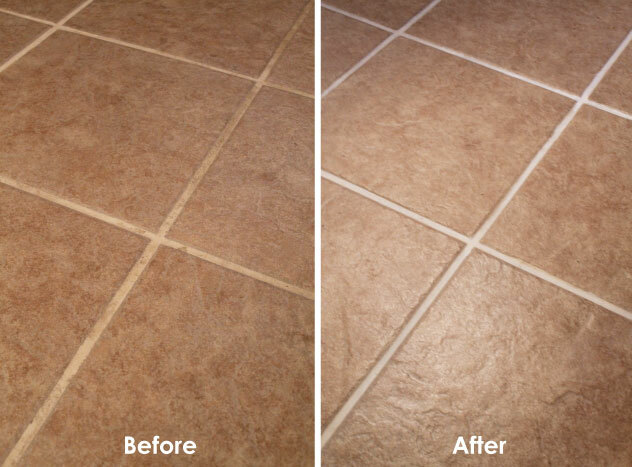 My excitement continued when I discovered a wonderful product that fixed our nasty kitchen grout problem. Talk about a miracle! As fall came to an end, so did my "Old House Tale" skeleton key mystery. I was able to connect with the new owner to swing by with the skeleton key I had found. 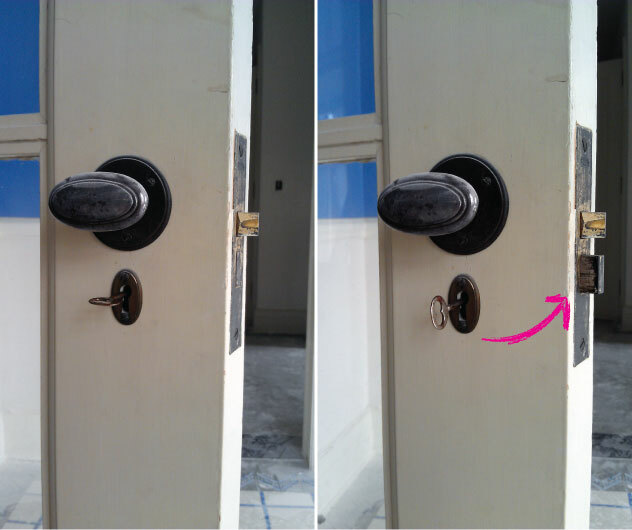 We discovered that the key did unlock some of the old doors in the house. Other keys might have worked too, but hey it was still pretty cool! Mystery solved! 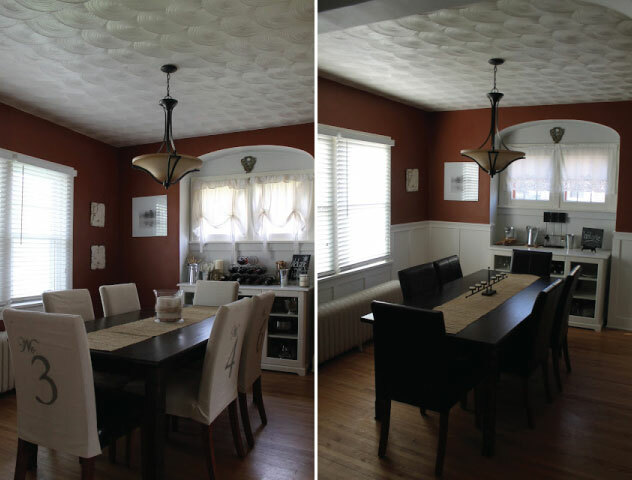 Our last project of the year was one that I tackled while Alex was out of town on a boy's cycling trip (except the light fixture, that is man territory). 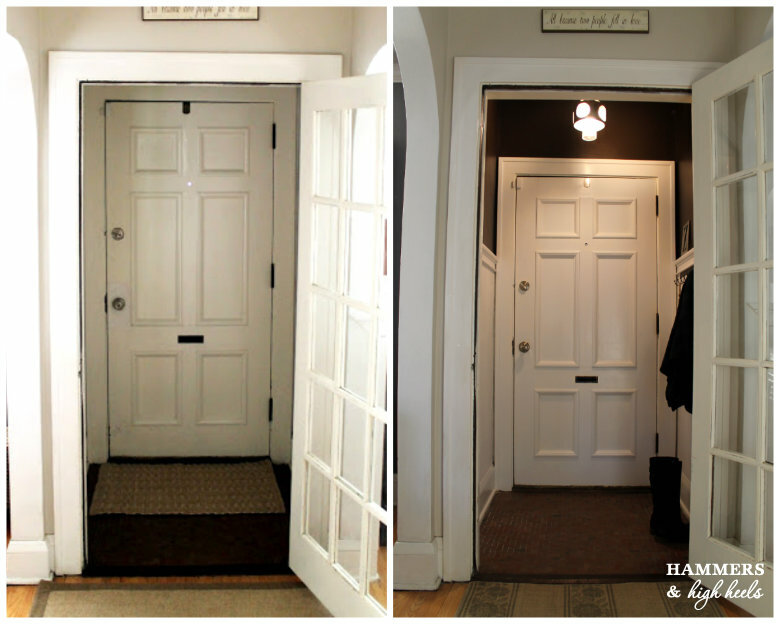 I took our plain vestibule entryway and made it an entrance! It was such a little space that we ignored for way too long, who knew it could hold so much character? Well, that rounds out the house projects for 2012, phew! That was a lot of photo loading and hyperlinking! 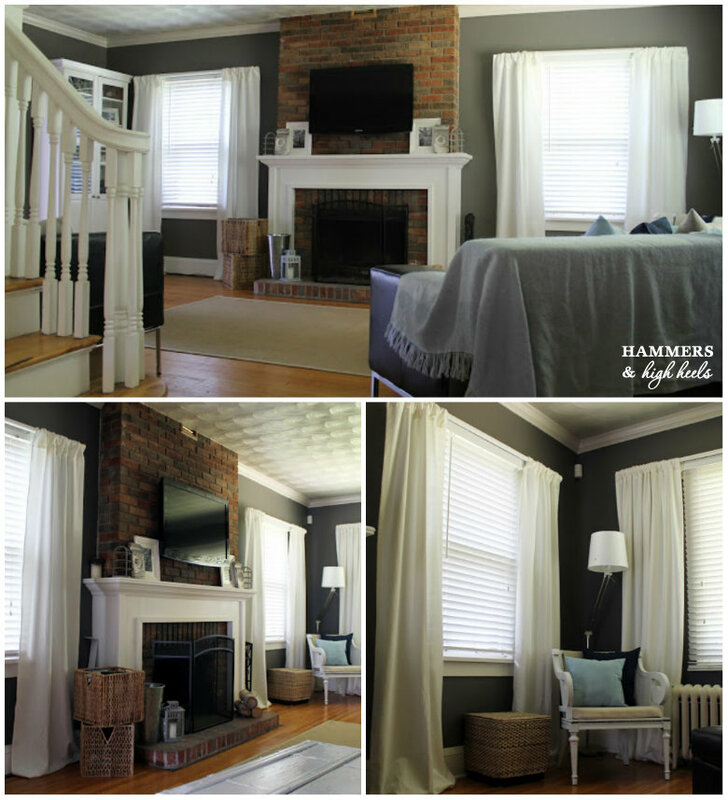 I hope you enjoyed a look back at our house projects with us! I want to recap everything else about the year now... But that might end up being a cluster of silly dog photos :) ha! What do you think our best/coolest project was this year? 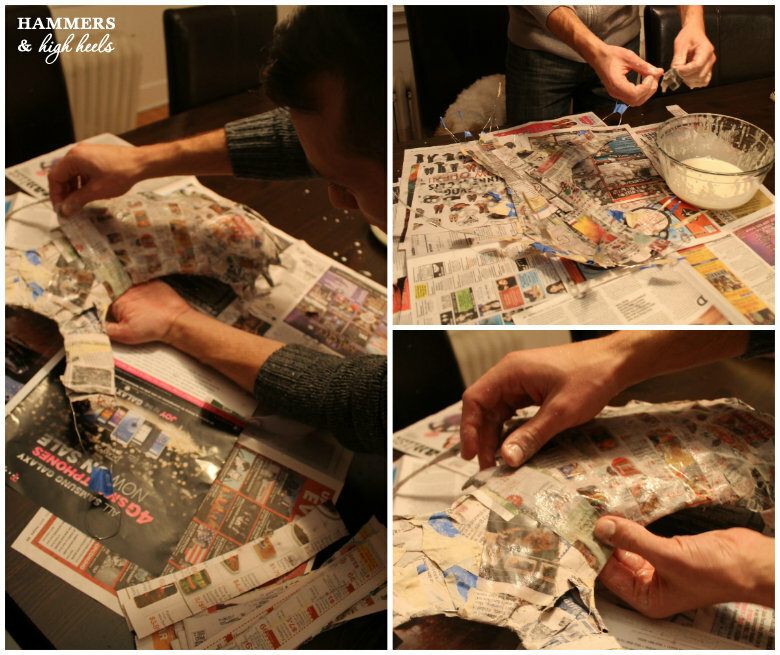 What was your favorite project that you tackled at home? What are you planning on for 2013? Like I said, taking a look back made me appreciate everything in 2012 more, so I hope you take time to reflect on all the things (big and small) that made your year special as well! Onward to 2013, cheers! Can you imagine this cute little bugger stealing your gifts on Christmas??? Certainly not :) unless it was something beef or cheese flavored, haha! 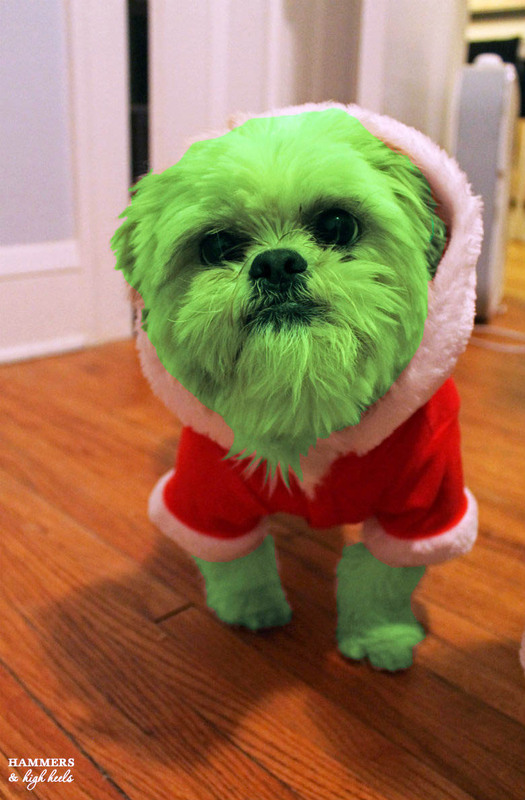 Still, even after photoshopping him green he still doesn't look mean, maybe just grumpy because mom put him in a Santa suit? 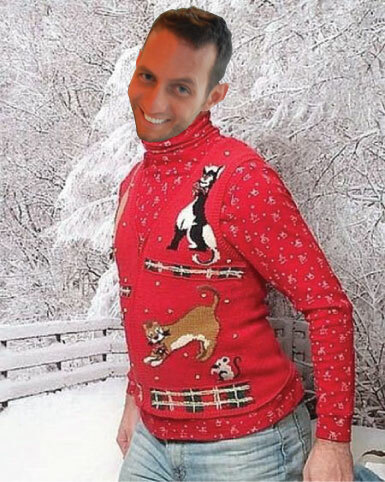 I found an awkward photo of a man in a holiday cat sweater and stuck Alex's head on his body. 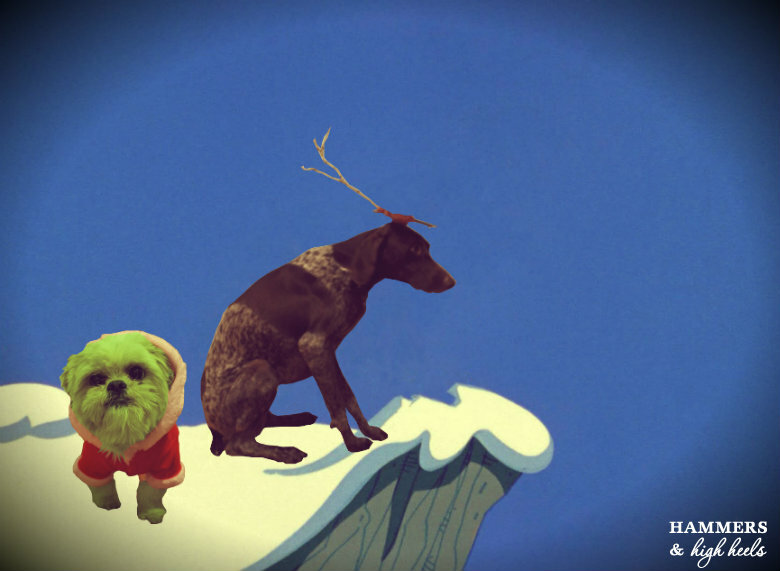 It ended up being our Christmas card that we sent to our family and friends, haha! Thankfully Alex was a good sport and thought it was hilarious too. Anyway, we hope you are slowing down too to enjoy time with family and friends during this special holiday. And hey, if you're not the Grinch might show up!!! 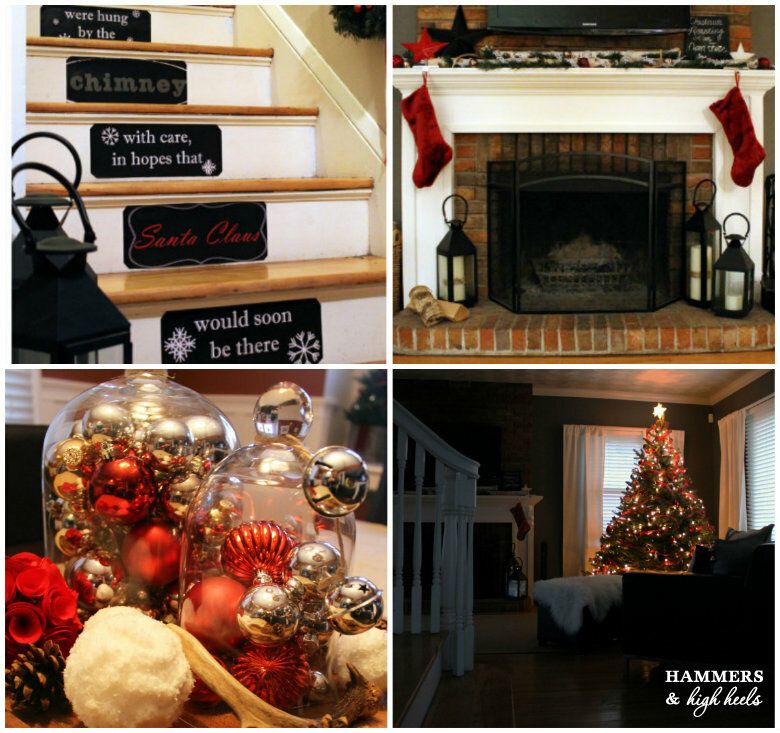 PS- If you haven't gotten a look, be sure to check out some of our 2012 Christmas decor including our staircase, mantel, tree and dining room! 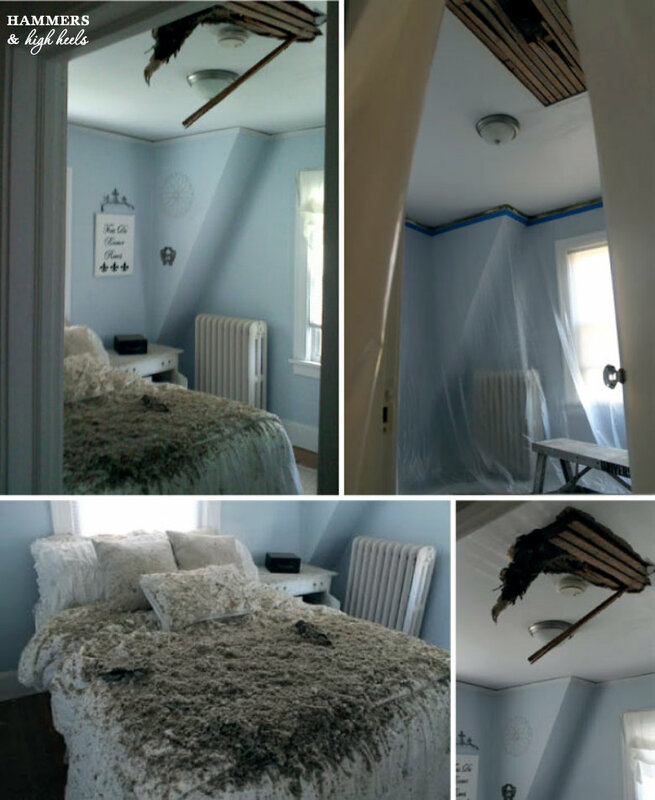 Stories from a glam girl who trades in her high heels for a hammer when she gets home. Memorial Day Mini Project- DIY Raised Garden Beds! Copyright © Hammers and High Heels. All rights reserved. Powered by Blogger.